His iconic ‘Hope’ poster of Barak Obama united a fractured nation, and help send the first African American to the White House. Before then, Shepard Fairey, a successful graphic designer, was better known for his Andre the Giant ‘Obey’ posters that would “appear” on buildings around Los Angeles, Chicago and New York. This past year, Fairey’s work was featured in a 2010 documentary about street artists called, “Exit Through the Gift Shop,” which was nominated for an Academy Award. 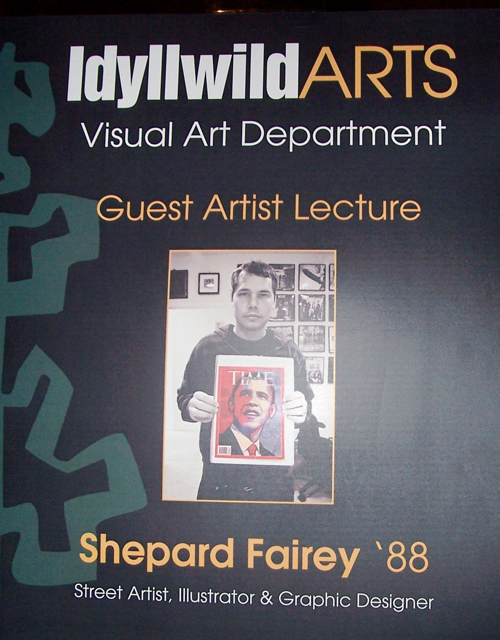 However, this Friday, Feb. 10, Shepard Fairey will be returning to Idyllwild Arts for the first time since his graduation in 1988. His 3:30 p.m. lecture at the IAF Theatre is a much-anticipated event, especially by the Visual Arts students. Some of them have been seen wearing “Obey” T-shirts and sweaters to class. Peter, a visual artist originally from China, was grinning from ear to ear when discussing the upcoming event. Peter was trying to think of a good question to ask Fairey during the Q&A portion of the lecture on Friday. Obviously, controversy doesn’t scare Fairey. After all, his “Obey” images are spray painted and stenciled on office buildings all over Los Angeles, Chicago, and other cities. Some start on the rooftops, so he can’t be afraid of heights or getting caught. “I think he was arrested once,” Peter added with a gleam in his eye. You can bet Fairey is revered even more now. According to web sites, Fairey has been arrested numerous times. In 2009, he was arrested in Boston for “tagging” two properties with his “Obey” image, including a railroad trestle. The police grabbed him on his way to his “Supply and Demand” show at the Museum of Contemporary Art. So the rebel artist is coming home to Idyllwild for the first time in 24 years. After graduation, he attended the Rhode Island School of Design and graduated with a Bachelor of Fine Arts in Illustration. At the Friday show, Fairey be featuring 16 pieces, including serigraphs and one print that also includes works by Nate Lowman and other Visual Arts alumni. Fairey’s pieces were picked up Tuesday from his Los Angeles studio on Sunset Boulevard., down the street from Disney Hall. The studio also houses a gallery of Fairey’s work that he’s created over the decades. 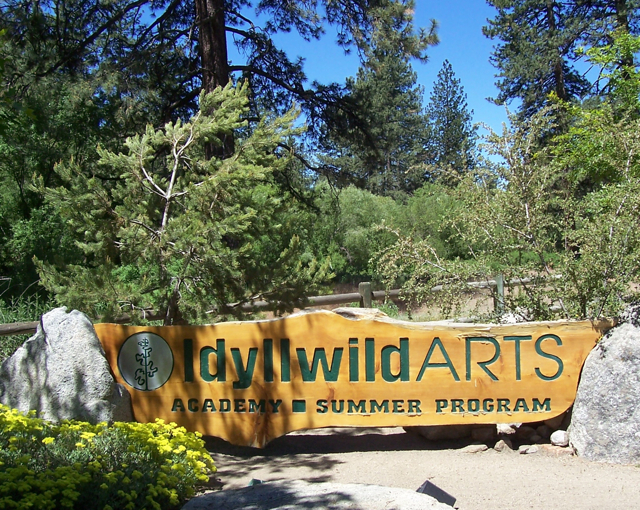 Mallory Cremin, an arts teacher who also runs the Parks Exhibition Center on campus, invited Fairey to speak at Idyllwild Arts more than a year ago with no definite plans. 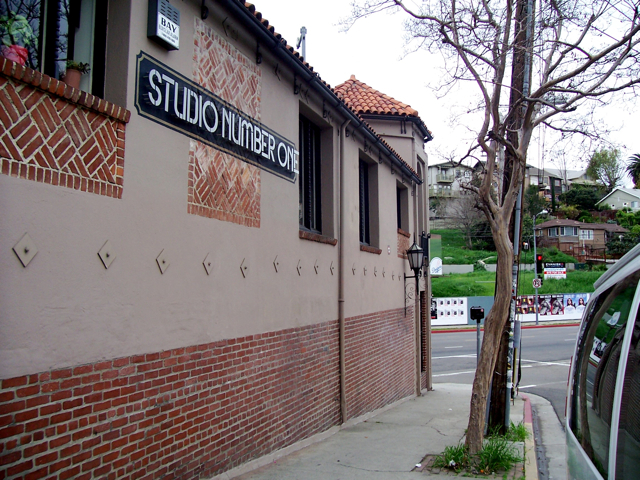 This past September, however, she and her printmaking students visited his gallery. “Afterwards, the students were so excited, they couldn’t wait to get back and try making their own prints,” Mallory said. She was persistent in emails with Fairey’s associate, Dan. “Until one day, our schedules finally came together,” Mallory said. While wrapping and loading up the artwork, Dan said that Fairey owns the original Obama “Hope” image, but a rose print is featured in the National Portrait Gallery (in Washington, D.C.) He said Fairey also got to meet the president. The 16 pieces, which were created by Fairey from 2001 to 2010, with prices ranging from $500 to $1,000 each, are not for sale, Mallory said. Those who are interested in his prints can buy them online. The Alumni Show should remain up in the Parks Exhibition Center for several weeks. Fairey’s work can be found at the Irvine Contemporary Gallery in Washington, D.C., the Museum of Modern Art, the Los Angeles County Museum of Art and the Victoria and Albert Museum in London. 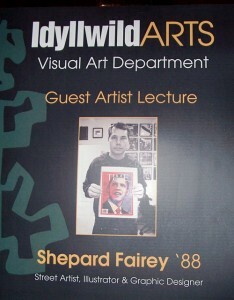 Shepard Fairey’s lecture at Idyllwild Arts begins at 3:30 p.m. at the IAF Theatre. 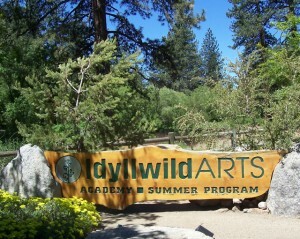 Like all Idyllwild Arts events, it is free and open to the public. However, arrive early to get a good seat. At 6 p.m., there will be an artist’s reception at the Parks Exhibition Gallery on campus. For more information on the event, call (951) 659-2171, or visit www.idyllwildarts.org. Shepard Fairey’s artwork, clothing and collectibles can be purchased online at www.obeygiant.com.